I had a plan for these photos, in my head at least. Things did not go to plan. I mean, there are only so many ways to make skincare look pretty in photos, but I can't help feel a little bit discouraged that you won't see the 'plan'. Oh well, it is what it is. At least we do get to chat up a few skincare goodies from Fresh. Ready? Is it a toner? Is it a serum...? Um, yes? Essence is one of those in between type of products that can be difficult to pinpoint exactly what it is, but it really is best described as a toner / serum hybrid. The fluid product is applied after cleansing but before your moisturizer and acts as a concentrate of skin loving goodness. We're all about the technical definitions here, clearly. Not outrageous claims for the realm of skincare, but not the easiest to verify, as most of us are going to be using this in tandem with other products. I've been using this for a few weeks, and I've enjoyed it as it does feel great, and is pretty instantly hydrating. That said, I don't know if I've seen any of the above results other than hydration. Aww, yes. Time to get misty. You know I love a facial mist. 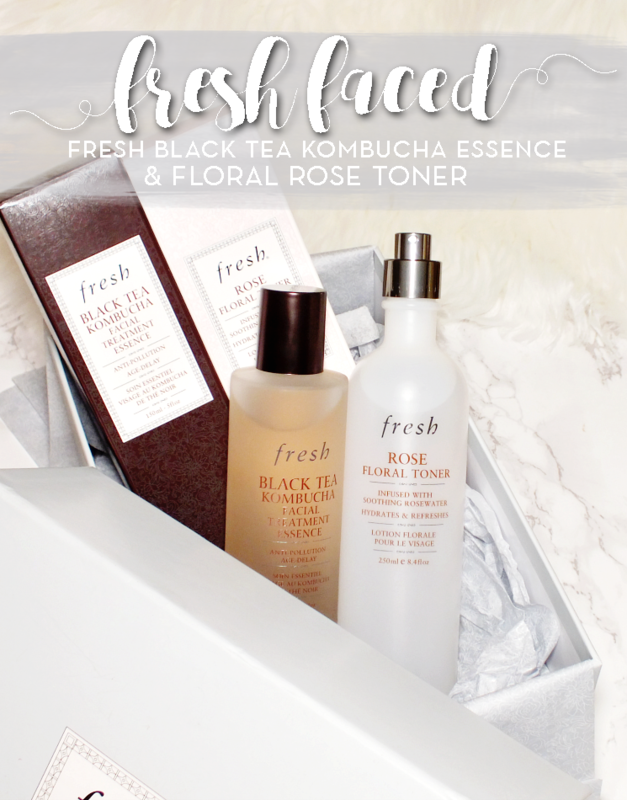 The Fresh Rose Floral Toner can be used as a toner or a mist. The bottle comes with a standard cap if you prefer to use this on a cotton round or a mist attachment for the mist lovers. I am the later. It is worth noting that the mist attachment does not have any sort of cap, so while the bottle is plastic, you really can't travel with this unless you plan on decanting. The toner/mist is pretty basic as it is rose water at its core (with some water and filler-type ingredients). There is nothing wrong with a little rose water as it is cooling, hydrating, calming and straight up a joy to mist on. It can be used for just about anything- post makeup removal, as toner, as a mid-day refresher, on sponges or brushes pre-makeup application, as setting spray...it really is the definition of a multi-use product. Overall, both are products I've enjoyed using, but I don't know that I can say are truly must-trys or overly necessary. The essence is quite pricey for something that may not be doing much other than hydrating and the rose toner is, well rose water with a rather inflated price tag. Sorry, Fresh, I usually love you but I'm just not sure where I fall with these. What do you think? Have you tired either of these products? Are you a fan of essences in your skincare routine?